British performer Freddie Highmore began his acting career in 1999 at the age of seven. In 2005 he was only twelve years old and had already built up a pretty impressive resumé. Highmore landed his first movie role at the age of seven in Women Talking Dirty, playing opposite veteran actress Helena Bonham Carter (1966–). From then on the plucky lad with the big, brown eyes and adorably large ears became a familiar face to Brits who caught him in small parts on television and in film. In 2004, alone, Highmore appeared in three movies, but it was his standout performance in the critically acclaimed Finding Neverland that brought him worldwide attention. Freddie Highmore was born on June 9, 1992, in England. Perhaps it was not surprising that he entered show business, considering his father, Edward Highmore, is an actor, and his mother is one of the country's top talent agents. In fact, it was thanks to his mother that he snagged his first auditions. "I thought it would be a fun thing to do," Highmore commented to Jenelle Riley of Back Stage. "I started off doing small parts on TV, and then the movies came along." Highmore's first film role was in the British comedy Women Talking Dirty (1999), in which he played Sam, the young son of an outspoken single mother played by Helena Bonham Carter. He then took small parts in several television productions, including Happy Birthday Shakespeare (2000) and I Saw You (2002), both British exports. The steadily working Highmore also played young King Arthur in the American television miniseries The Mists of Avalon (2001). His first real break came in 2004 when he was cast in the family drama Two Brothers, the story of two tiger cubs separated at birth. Highmore played Raoul, a young boy who adopts one of the cubs. Since the movie had a worldwide release, it was the first time audiences on a large scale had the opportunity to see the fledgling actor at work. Highmore had already completed another role, however, that would catapult him from cute kid actor to bona fide film star. In early 2002, when he was just nine years old, Highmore was cast in the movie, Finding Neverland, directed by German-born filmmaker Marc Forster (1969–). Neverland was based on the stage play The Man Who Was Peter Pan and chronicles an episode in the life of Scottish writer J. (James) M.(Matthew) Barrie (1860–1937), creator of the world-famous character Peter Pan. "I hope that I'm sort of a normal boy." Kensington Gardens in 1904 London, England. The author strikes up a friendship with Sylvia Davies, a beautiful young widow, and her four sons, Jack, George, Michael, and Peter, all of whom are devastated by the death of their father. Peter, in particular, has been hard hit and is becoming more and more emotionally withdrawn. During their outings in the park, Barrie begins to weave elaborate stories for the boys, eventually creating an imaginary place called Neverland where children never grow up. Inspired by the innocence and wonder of his young friends, Barrie puts pen to paper and creates the story of Peter Pan. Forster nabbed Oscar-nominated actors Johnny Depp (1963–) and Kate Winslet (1976–) to play Barrie and Sylvia Davies, but he had a harder time casting the roles of the young Davies brothers—that is, until it was time to cast Peter and in walked Freddie Highmore. "I think Freddie is pure magic," Neverland producer Richard Gladstein told Lisa Hirsch of Variety. "He was the first actor that read for Marc and I, and he defined the character. We went on to see a few others but by the end of the day we knew we had found our Peter." Gladstein even remarked that casting Highmore was central to the movie's success. Although Forster had complete confidence in his young star, some of the Neverland cast had their doubts. As a result, on his second day of filming Forster purposefully shot a pivotal scene where an emotionally tortured Peter tears up a book and demolishes a playhouse. Highmore acted with such maturity and gut-wrenching realism that afterward no one questioned his abilities. In fact, some of his heartiest congratulations came directly from his costars. As Winslet (best known for her starring role in the film Titanic ) commented to Jenelle Riley of Back Stage, " [Freddie] is quite something else. I would literally get hairs up on the back of my neck watching this kid act." Audiences and critics agreed. While Depp received high marks for his portrayal of the eccentric Barrie, young Highmore was applauded over and over for capturing the pain and angst of the troubled boy who served as the inspiration for Peter Pan. According to Riley, "He has several emotionally wrenching scenes in the film that he carries off with the experience of an actor twice his age." Highmore "steals scenes from his costars Kate Winslet and Johnny Depp," commented Donna Freydkin of USA Today. And after enthusiastically praising Depp's characterization, Paul Clinton of CNN.com wrote: "But it's 12-year-old Freddie Highmore as Peter . . . who will break your heart." In the early 2000s there seemed to be a run of movies based on classic and popular children's books. In 2004 Freddie Highmore appeared in Finding Neverland, which explored the real-life inspiration for Peter Pan, and the film Five Children and It, adapted from the book of the same name by E.(Edith) Nesbit (1858–1924). In 2005 Highmore starred in yet another page-to-screen vehicle— Charlie and the Chocolate Factory, based on the Roald Dahl (1916–1990) story. 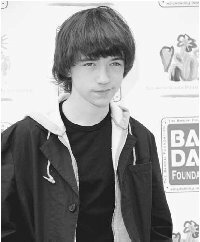 Another rising young star named Liam Aiken, who is just two years older than Highmore, also gave life to a literary character when he costarred in the 2004 screen adaptation of Lemony Snicket's Series of Unfortunate Events, an enormously popular contemporary children's book written by Daniel Handler (1970–). Liam Padraic Aiken was born on January 7, 1990, in New York City. Like Highmore, Aiken came from a show business family—his father, Bill Aiken, was a producer for MTV and the children's television network Nickelodeon. Unfortunately, Bill Aiken died of cancer when young Liam was not quite three years old. Another Highmore similarity is that Aiken, too, made his acting debut at the age of seven: he appeared on the Broadway stage in the play A Doll's House, written by Norwegian playwright Henrik Ibsen (1828–1906); he also had a small part in the 1997 movie Henry Fool. From then on, Aiken landed roles in film after film, appearing in at least one movie per year with some of Hollywood's biggest names. His filmography includes The Object of My Affection (1998), which starred Jennifer Aniston (1969–); Stepmom (1998), featuring Susan Sarandon (1946–); Sweet November (2001) with Keanu Reeves (1964–); and Road to Perdition, where Aiken portrayed the youngest son of the film's star, Tom Hanks (1956–). Aiken's breakthrough role, however, came in 2003, when he nabbed the lead in Good Boy!, a family comedy about a dog from outer space who visits planet Earth. Good Boy! paved the way for Aiken's first big blockbuster movie, Lemony Snicket's Series of Unfortunate Events, based on the quirky and dark children's series written by Daniel Handler. Aiken was cast as bookish twelve-year-old Klaus Baudelaire, who has the amazing ability to remember everything he reads. Many members of the press compare Aiken to his Snicket costar Jim Carrey (1962–), primarily because of his wide grin and animated facial features. Perhaps one day he will be as famous as Carrey, but if the kid who now hails from New Jersey does not make it as an actor, he can always fall back on one of his two other interests—performing magic or playing acoustic guitar. Aiken is an enthusiastic punk rock fan and particularly admires Rage Against the Machine's Tom Morello (1964–), who is considered to be one of the most influential guitarists of modern rock. Highmore would have become the fourth-youngest actor to be considered for an Academy Award. The twelve-year-old was nominated for several other honors, including a Screen Actors Guild (SAG) Award for male supporting actor. SAG Awards are particularly coveted honors because they are given out annually by members of the Screen Actors Guild, which is the premier professional actors' organization in the United States. Considering the publicity hype surrounding Neverland was enormous, reporters claimed that in interviews Highmore spoke maturely and articulately, and that he did not behave at all like a pampered Hollywood star. In fact, he tended to downplay his incredible acting abilities, claiming that tapping into his character's gloominess was rather easy. As Highmore explained to Donna Freydkin, "When you think about it, your dad's dead and your mum's dying, so yes, it is quite sad." 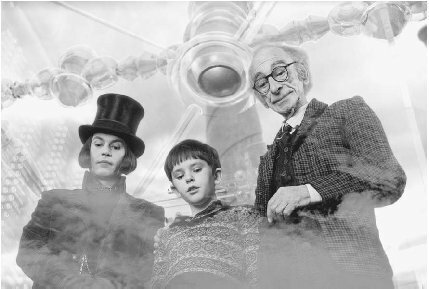 Freddie Highmore as Charlie Bucket (middle) and Johnny Depp as Willy Wonka (left) in a scene from the 2005 movie Charlie and the Chocolate Factory. Amid the seemingly endless round of print and television interviews, Highmore still found time to appear in a third movie in 2004: a screen adaptation of the children's classic Five Children and It, written in 1902 by British author E.(Edith) Nesbit (1858–1924). He also began filming another page-to-screen movie, Charlie and the Chocolate Factory, based on the book of the same name by famous British children's writer Roald Dahl (1916–1990). Charlie featured Highmore's Neverland castmate Johnny Depp as the eternally youthful candy maker Willy Wonka. When Depp's friend director Tim Burton (1958–) tapped the actor to play Wonka, Depp specifically requested that Highmore be cast as the boy lead, Charlie Bucket. "It's neat," Highmore told Jenelle Riley of Backstage.com, "because in the film Charlie has a dream to visit the chocolate factory, and it comes true. My dream was to work with Johnny again, and it also came true." After only ten days in movie theaters the movie had received critical acclaim and earned over $114 million. Highmore's dreams for the future are a little less clear. He is vague about whether or not he wants to act as an adult. "I'm not really sure," he admitted frankly to Riley. "I really think I'd like to travel the world, see the rainforests. We'll see how it goes." In the meantime, when not on a movie set Highmore is your run-ofthe-mill boy who enjoys playing the clarinet and loves to kick a soccer ball around with his friends. In fact, in most interviews he is just as excited to talk about his favorite soccer team, Britain's Arsenals, than his own profession. It is also apparent that Highmore's head has not been turned by his fame. As Johnny Depp commented to USA Today , "He's an amazing kid. Beyond that, he's an amazing guy. Very pure. Very honest. Very normal. That's very refreshing." Highmore has two films slated for release in 2006: the animated film Arthur and the Minimoys and the drama August Rush. Freydkin, Donna. "This Kid Is Hanging with the Big Boys." USA Today (November 12, 2004): p. 0E3. Galloway, Stephen. "Acting Up: Their Roles Are Meaty, Their Talent Apparent." Hollywood Reporter (November 17, 2004): p. S-48. Koberdanz, Kristin. "Q … A: Freddie Highmore." Time (November 29, 2004): p. 155. Clinton, Paul. "Finding Neverland: A Joy to See." CNN.com : Entertainment (November 19, 2004). http://www.cnn.com/2004/SHOWBIZ/Movies/11/19/review.neverland/index.html (accessed on August 23, 2005). "Freddie Highmore: The Next Big Star." Young Star News (November 21, 2004). http://www.youngstarnews.com/news/041121-001-highmore.htm (accessed on August 23, 2005). Hirsch, Lisa. "Freddie Highmore: Finding Neverland." Variety.com (January 4, 2005). http://www.variety.com/ac2005_article/VR1117915691?nav=actor…categoryid=1809 (accessed on August 23, 2005). Hirsch, Lisa. "Freddie Highmore, 12." Variety.com (November 18, 2004). http://www.variety.com/article/VR1117913724?categoryid=1853…cs=1…s=h…p=0 (accessed on August 23, 2005). "Liam Aiken Biography." Independent Movie Database. http://www.imdb.com/name/nm0014582/ (accessed on August 23, 2005). Riley, Jenelle. "Finding Freddie." Backstage.com (January 7, 2005). http://www.backstage.com/backstage/features/article_display.jsp? vnu_content_id=1000748684 (accessed on August 23, 2005). Highmore is such a great actor, i have seen him in a couple of movies such as charlie and the Chocolate Factory and finding Neverland he plays those films with true heart, you can tell. Freddie Highmore is such a great actor. He's been so good in every movie I've watched him in. He almost made me cry in Finding Neverland. He was so sweet. I really hope to meet him someday. He's a true actor that nobody will forget. i have seen almost all movies of Highmore and loved them all.i love his acting! I am so impressed with his role as The Good DR., had to look him up, did not realize he played all the parts he has. Wanted to see if he was really autistic, I worked with children who are, he does the part so well. Bless him, he will go far! Freddie Highmore is brilliant. The good doctor was outstanding and Bates Motel with Vere Farmiga, sheer brilliance. Cannot wait to see this amazing young actor in another series/film. Compulsive to watch!